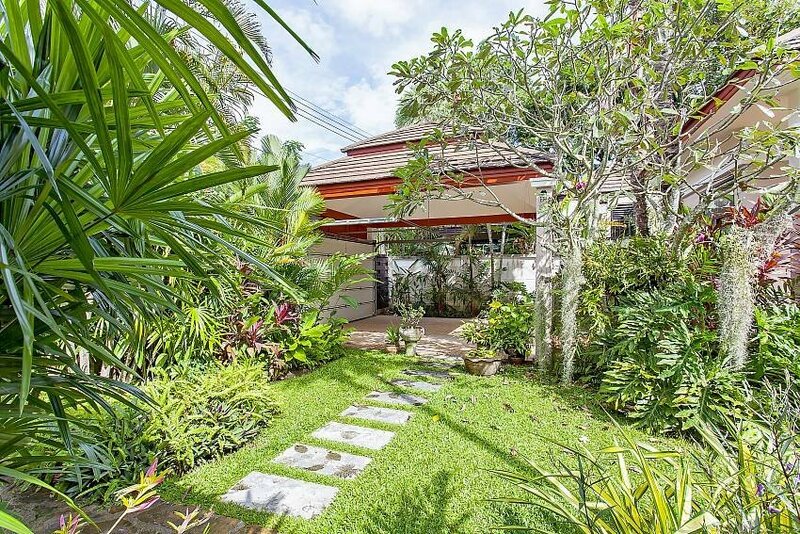 Here is a villa that has it all – a quiet location in one of Thailand’s most exciting beach cities, and a large versatile space in which a group of 6 can enjoy both shared moments as well as privacy. The single-level villa has a garden with a swimming pool at its center, along with a waterfall corner, small fish pond, Sala with seating, sunbeds, and tables and chairs. There is also a BBQ so you can spend an afternoon cocooned in our own slice of tropical paradise. The villa has a standalone kitchen that is fully equipped for seamless meal preparation, including a microwave, kettle, toaster, coffee maker, and a rice cooker. Next to it, there is another building that comprises a sizable living room space with an office corner and dining room. The living room features a TV, CD/DVD player, and Surround Sound, ensuring fun even when you stay in. The villa’s 3 bedrooms are in 2 standalone buildings: the master bedroom with an en-suite bathroom is separate from the other two bedrooms that share one bathroom. All bedrooms are steps away from the pool and beautifully furnished, each with a wardrobe, TV, ceiling fan and air-con. The master bathroom also has a bathtub. Additionally, the villa has an electric gate, a garage, and a safe. The rate includes free Wi-Fi and cleaning every four (4) days, with towels/linen change once a week. Free 5-seat car usage is also included (a safety deposit is needed and you will be paying for gas). Many restaurants and bars are 1-2 km away, and beautiful Jomtien Beach is a 15-20 minutes’ drive away from the villa.